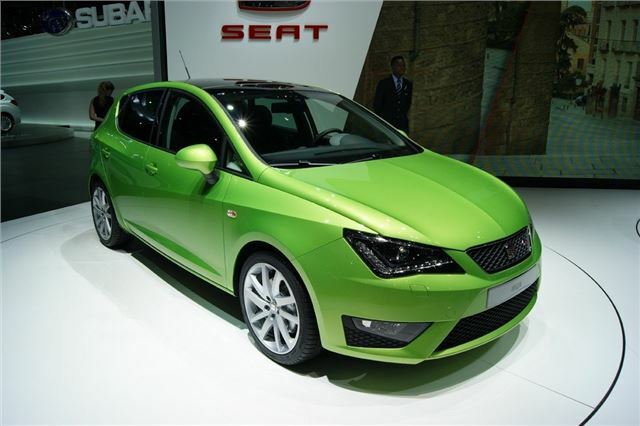 The recently revised SEAT Ibiza range goes on sale this month and prices have actually been cut across the range with up to £1100 off some models. Along with the sharper styling, the improved Ibiza also gets higher specification levels and a broader range of engines offered across all trim levels. The entry level E model is still priced at £9995 but the more popular S A/C trim is, on average, £300 less than the outgoing equivalent. Five door models start from £11,430 for the 1.2-litre S A/C. The SE trim has also been reduced by an average of £300 and is now available with a 1.2 TSI petrol and 1.6 TDI diesel, both with 105PS. These engines join the existing 1.4 petrol and 1.2 TDI. All four engines are available in three-door, five-door and ST bodystyles while a seven-speed DSG gearbox is an option with the 1.2 TSI. The sporty FR trim has been expanded to include the same new 1.2 petrol and 1.6 diesel as the SE, plus a 143PS 2.0-litre diesel and 150PS 1.4 TSI with DSG automatic gearbox. The FR trim level has been expanded to include ST estate models and buyers can save as much as £1100 over the outgoing FR. Order books are open now and demonstrators should be with dealerships in April. You can read more about the facelifted model here.